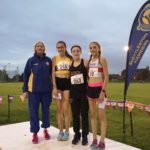 Lachlan Oates picked up the Alex Naylor Memorial 3000m title at the Milnbank Housing Association Shettleston Harriers Open Graded Meeting at Crownpoint during the first of the Club’s Meetings in a time of 8.31.54 . Club Teammate, Daniel Bradford, finished second shaving 0.3 seconds off his PB, running 8.33.35 with Fife AC’s Owen Miller in 3rd place. In the Women’s race Annabel Simpson of Glasgow University was first taking 6 seconds off her PB, Kilbrachan’s Kerry MacAngus was second in 9.50.46, also a PB. 3rd was Anna Hedlay of Fife AC. The heats of the Derek McLean 800m saw Jacob Luc, Gregor Collins, Oscar Logan, Lewis Hainey, Donald Gilchrist , Ben Sutherland , Conor Gourley and Lewis Roddis qualify for the final next week (28th August)..
Heat 1 of the 800m saw a deadheat with Alex Johnston(Pitreavie) and Finlay Murray (Inverness) sharing the honours. A HUGE BIG THANK YOU TO ALL OFFICIALS AND HELPERS. Without these people giving up their free time our sport could not function and the club really appreciates all the help to allow this event to go ahead. Also can the club thank the Staff at GC Crownpoint for all their help.